With the battle for places in the 2006 World cup on going, one might be desperate to take a look at Africa`s prospects in the championship. 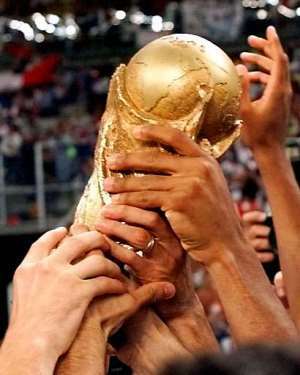 Africa`s presence at the world cup has been enhanced by the past sallies of Cameroon, Algeria, Tunisia, Egypt, South Africa, Zaire (Congo DR) , Nigeria and Senegal in the competition. Since 1982, when the duo of Theophalous Abega and Roger Milla inspired Cameroun to a debut at the world cup, the Indomitable Lions have had only one miss in the comptition. In 1990 when Milla, then retired rejoined the team upon a request by the Camerounian President, the Indomitable Lions recorded as the first African Nation to reach the quarter final stage, claiming notable scalps in the process. Nigeria was also big in their first appearance in 1994 with names like Rashiid Yekini, Daniel Amokachi, Sampson Siasia, George Finidi and Emmanuel Amunike. Having won the Under 17 tournament a year earlier and the Nations Cup in that World Cup year, the Super Eagles became a force in world soccer. However, thier painful exit by Italy was something people like me would wish to forget. Even in 1998 when the team had additions of Garba Lawal and Victor Ikpeba, Nigeria could not better their previous feat, losing 1:4 to Denmark. Although judging by their recent form, South Africa has a lot of grounds to cover if they are to achieve the level of enterprise that won them the Nations cup in 1996 when they hosted it for the first time. Rapidly establishing itself as a name in world soccer, the Bafana Bafana has been constantly present at the world cup final since 1998. Senegal , a hitherto unknown quantity in world football tore up the form book in the 2002 edition. El Hadji Diouf and associates who had taken over the mantle from Julius Bukande, Sulemane Sannie etc took the world by surprise beating the then world champions France in the opening of the competition. As the journey to Germany 2006 is in progress, we are waiting to see how they would take another giant step into the competition. Others like Egypt, home to two of the most potent clubs on the continent, Zamalek and Ahly, Algeria, Tunisia etc are as also commended for their appearance at the world cup, thus contributing to the formidable status enjoyed by the continent in world football. Qualifying to world cup is different ball game in Africa and for most countries, it took years of team building and organised team management. There have been instances of expartriate coach recruitment aimed at enhancing team's achievement. Ghana still maintains the surprise of missing the world cup final despite winning the Nations cup four times and producing three Africa player of the year in Ibrahim Sunday, Abdul Razark and Abedi Pele. The two-time FIFA Under 17 winner boasts of Asante Kotoko and Hearts of Oak, two prominent clubs in Africa which have won the African Clubs Championship Cup/Champions League twice and ones respectively. This time, the Black Stars are optimistic not to allow Germany 2006 escape them. The team has reservoir of young and old talents to bring into play. It is my hope that for the first time in history, the Black Stars would leave no stone unturned in the build up to Germany 2006. Ivory Coast has also been another contender for a place in the World Cup. They had Abdulai Traore, Omar Ben Salla, Acka Kouami, Allain Gouamene etc who on their way to US 94 were denied by Nigeria. With the era of these stars over after Lauren Pokou, the highest scorer in the history of Nations Cup, Didier Drogba, Aruna Dindane, Kolo Toure etc would continue to raise the flag of the nation high in qualifying to the World Cup for the first time ever. They top their group in the qualifiers, signaling to Ghana that if the Black Stars are not ready, they (Ivory Coast) cannot wait for long. Others like Chad, Tanzania, Namibia, Mozambique, Djibouti, Gambia, Mauritania, Sao Tome amd Principi can as well secure a ticket to the world cup Africa soccer legends of Theophalee Abega, Roger Milla, Kalusha Bwalla, George Weah, Rabah Madjer, Roger Milla, Sam Okparaji and Robert Mensah of blessed memory, Abedi Pele, Philip Omondi (top scprer, CAN 78), Lauren Pokou, Mamoud El Gohari,Yussif Fofana, Salif Keita, etc really gave different dimention to soccer despite not bringing the World cup to Africa. As to when the the cup would come to Africa, time will tell. Views expressed by the author(s) do not necessarily reflect those of GhanaHomePage.